The red carpet is out for the great and good of the European football world this weekend. And Ireland's preparations have been reminiscent of that old Yellow Pages ad where a bedraggled youth wakes up in a house resembling a bomb site and has to call in the French polishers before the parents come home. Everything's been grand here lads, honest. Landing the Euro 2020 draw honours was a political compliment to the FAI, and John Delaney was anxious to have a new manager in place for the jamboree. He ended up with two, of course, and Ireland's next boss Stephen Kenny indicated earlier this week that he might stay away. The current one, Mick McCarthy, will be present and waiting for the first major development in his bid to make his return a successful one. It's all out of his hands. Michel Platini was the man behind the idea of spreading this version of the Euros around the continent, but didn't get to hang around for long enough to drink in the love from the initiative. It will set up quite a fractured tournament summer in 2020, a triumph for airlines and hoteliers that will be bereft of the festival atmosphere that really makes these competitions hum. Still, there is a novelty angle that has made this a significant renewal for the smaller nations named as co-hosts. If Ireland manage to qualify, they will get to play two group games in the Aviva Stadium. There could be around €15m at stake in this campaign, which explains why the FAI entrusted the short-term responsibility to McCarthy. The first match of his second stint will be a qualifier in March. His major regret is missing out on Euro 2000 courtesy of that infamous last-minute heartbreak in Macedonia so there's of unfinished business there, much as he has actually banned the term. For the FAI, it's just business. These draws are about more than just plotting the course to the next tournament. It's about laying out the commercial plan for the year ahead, and there can be competing interests. The glamour draws fill seats, but the lower-profile tests might lead the way towards the light at the end of the tunnel. Embarrassment at the absence of a manager was one of the theories put forward about the FAI's haste to make an appointment, but they will have to go the Christmas market with some offers and the laying out of the fixtures after tomorrow's draw will help in that regard. At his 'unveiling' last Sunday, McCarthy made it clear to everyone that he hadn't taken the time to mull over his preferences from the available pots, with Ireland dropping to third seeds following an autumn of regression. "No" was the succinct reply when asked if he had any thoughts on it. That was understandable enough, given the pace of events leading up to his unusual arrival. He will be well aware of the situation now, however, and the state of play when it comes to Ireland's position. The top two from each of the ten groups will qualify automatically, with the remaining four places filled through the play-offs arising from UEFA Nations League performances. That is Ireland's fallback option, and the accompanying panel will explain why there's a fair chance they will still end up in a play-off of some description even if they fail to secure an automatic berth. However, a return of just two points from four games under Martin O'Neill means that it is more likely to be a tough one so they really cannot afford to bank on that. Germany's presence in pot 2 is the wildcard element of this draw, ensuring that one side in each of the pots below is going to find themselves in a particularly testing group. Much as Robbie Keane's strike in Ibaraki at the 2002 World Cup was a high point of McCarthy's tenure, the manager and his new assistant could do without the nostalgia trip. Ireland's chances of landing a nightmare combination from the top two pots have been decreased by one of the perks of being a host. A maximum of two host nations can be drawn together in each group in order to give them a better prospects of qualification. Germany are in that bracket, and so are top seeds England, Spain, Italy and Holland. There is no way McCarthy's men can land Joachim Loew's side plus one of that quartet. On the flip side of that, a one two with France, Belgium, Croatia and Portugal is possible. Switzerland and Poland are the kind options of the leading lights. In reality, the other sides in Germany's drum are all in or around the same level but a reunion with Denmark and Wales would be unwelcome for a variety of reasons. Down in pot 4, Romania and Greece are the two obvious sides to avoid. That said, the argument that a blanket can be thrown over the middle rump of the sides in the UEFA zone is a fair enough one. Any team that generates a bit of form and momentum at the right time will have little to fear from those around them - with the Germans the obvious exception. Ireland have looked like a poor side throughout 2018, and there's an argument in favour of a softer landing in order to regain the winning habit, although the contrasting take is that a tough draw might focus the minds and result in a favourable bounce. McCarthy will not be overthinking it. In the aforementioned Euro 2000 campaign, his team found themselves in a Balkan-heavy group with Yugoslavia, Croatia and Macedonia. 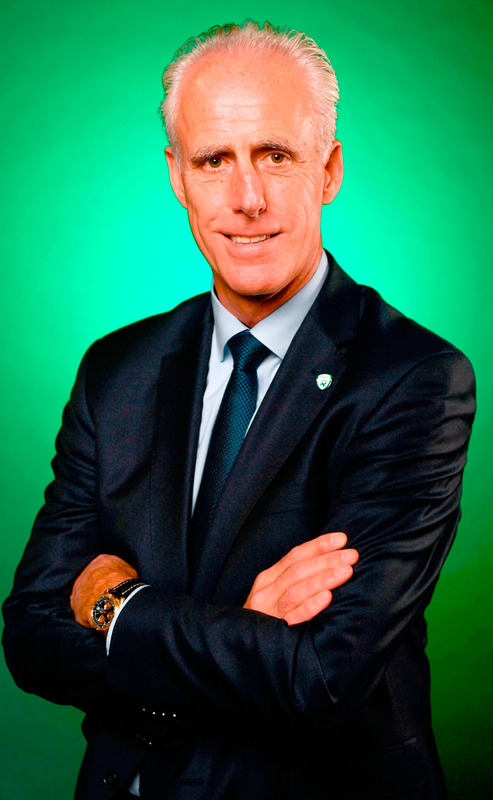 The FAI had to fight hard to try and get fixtures at the right times before the campaign was disrupted by tensions in the region. There is no comparable option available now, and the order of the matches is generated by computer. Ireland's first step towards the ultimate of aim of throwing a proper party in 2020 really will be shaped by luck. McCarthy can only sit back and hope for the best. Portugal and Switzerland are guaranteed to be in five team groups because they will play out the conclusion of that competition next June. The top two teams in each of the ten qualifying groups will progress automatically to the finals in the summer of 2020. Meanwhile, the four remaining places in the 24 team competition will be filled via the UEFA Nations League playoffs. They did, but they were in the second strongest section and it’s expected that quite a number of teams from League B will go through automatically. And most of the teams in the Group A should go through too. Teams from the lower league will be bumped up to fill out League A places if fewer than four miss out. PUT IT IN SIMPLE TERMS. HOW COULD IRELAND MISS OUT ON A PLAYOFF IF THEY DID BADLY IN THEIR QUALIFYING GROUP? ARE THERE ANY TEAMS THAT WILL BE KEPT APART? 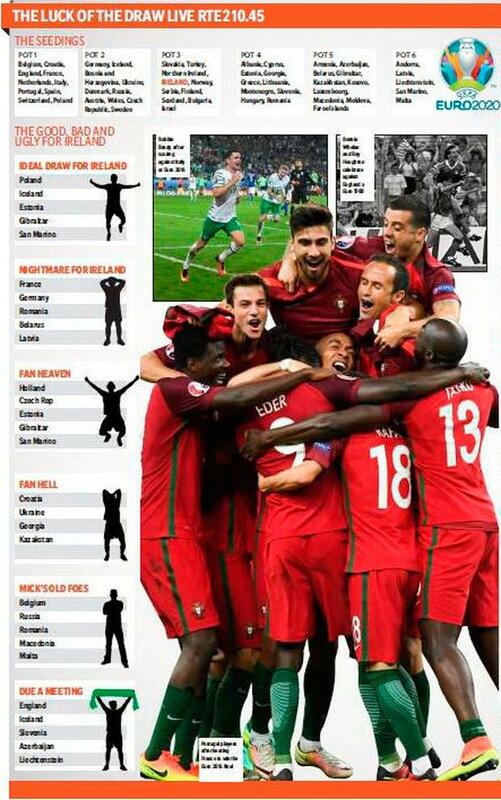 WHEN WILL IRELAND KNOW THE ORDER OF FIXTURES?